Do you love Brussels sprouts? I hope so! These Maple Cranberry Brussels Sprouts are a sweet yet tangy twist on a classic vegetable recipe. 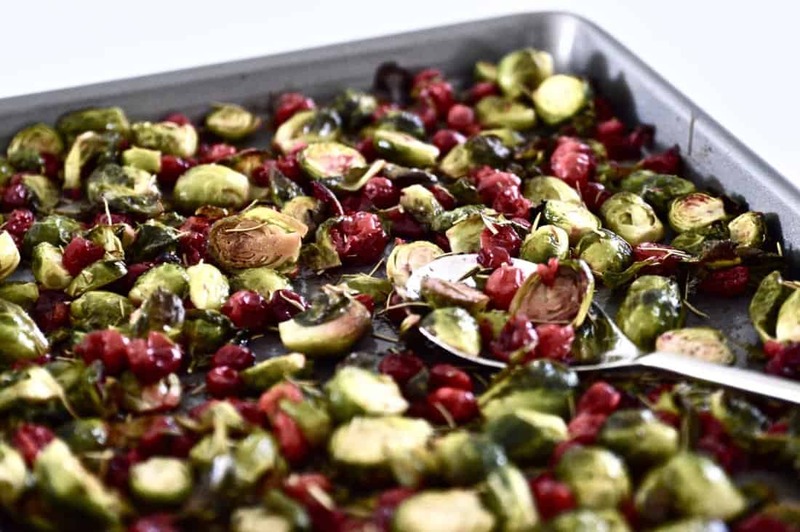 This Maple Cranberry Brussels Sprouts recipe makes the perfect addition to your holiday menu and is a dish that your guests are going to love. 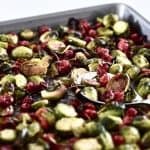 What’s even better is that this Maple Cranberry Brussels Sprouts recipe is paleo, vegan and AIP friendly! Happy Monday friends! Today we are making Maple Cranberry Brussels Sprouts and let me just tell you one thing: they are amazing! This is my new favourite way to make Brussels sprouts. I made these for Thanksgiving and everyone loved them. So I just had to share the recipe with you all. Because I am nice like that. How was your weekend? Mine was good! I am currently in San Diego for the American Rheumatology Conference. I spent all morning in sessions yesterday cramming my brain with knowledge, but then I took the afternoon off to get some lunch at Cafe Gratitude and go for a run. I had the best vegan chocolate turtle cheesecake at Cafe Gratitude. Seriously the best. It is going to take all of my willpower not to go back for a slice everyday that I am here. You see I pass Cafe Gratitude on my way to and from the convention centre. Danger my friends, danger. I think I need to figure out how to recreate the recipe for myself. It is just so darn good! And there’s nothing like a little food challenge to get me excited. I will plan on giving you a full recap of my trip in the next few weeks when I am home. I haven’t got everything planned yet but I am definitely going to head to the zoo, the Museum of Man, do a little shopping and likely head to Coronado. And of course eat as much yummy food as possible. There are just so many more paleo friendly options here compared to home. I feel like I need to load up on all the goodies before I have to start my candida diet when I get home. Let me just say I am not looking forward to that. At all. But if it will help my bowels and skin it will be totally worth it. I am also pretty darn happy with the weather here. I have been in bare legs and sandals since I arrived. Nothing like the blizzard I left in Calgary that’s for sure. I have been able to go running outside which always makes my soul happy. People ask me all the time how I manage to stay fit when traveling and running and walking everywhere is one of my biggest recommendations. I actually wrote an entire post on this topic because I am a firm believer that fitness is not something that has to be abandoned when you travel. You can read my entire post How To Stay Fit While Traveling for all of my traveling fitness tips. Some of them may surprise you! Now, on to more serious matters. Do any of you watch The Handmaid’s Tale? Oh man I just started watching it on the plane ride here. It is probably the most disturbing show I have ever watched, but it is so, so good! Like vegan chocolate turtle cheesecake good. I have been binge watching it for the last few days. I’m just about to start episode 5. So don’t ruin it for me, but if you haven’t watched it yet I am highly recommending it. That and This Is Us if you haven’t jumped on that bandwagon yet. I am not usually a big TV watcher but between those two shows I know I am going to be busy for a while. I am so excited for this week’s recipe. These Maple Cranberry Brussels Sprouts are my new obsession. A little tangy, a little sweet and a lot delicious. This dish was a big hit when I served it at Thanksgiving this year (I am in Canada so we already had ours). If you are in the US, I highly suggest you add these Maple Cranberry Brussels Sprouts to your Thanksgiving plans. Your family will thank you I promise. Not only are these Maple Cranberry Brussels Sprouts paleo, but they are also vegan and AIP safe. You can thank me later. I can’t believe this is only the second Brussels sprouts recipe that I have put up on the blog. I am obsessed with Brussels sprouts so you would think that I would have a ton of recipes on here. I am definitely going to have to fix that. But my first Brussels sprouts recipe, Sauteed Beef and Brussels Sprouts is a reader favourite because it is super easy and so, so tasty. It was one of the first recipes I ever posted so the photos are less than amazing but don’t let them discourage you. I promise you the dish is yummy. Really yummy. Now, before you get to the recipe, if you haven’t yet, make sure you are signed up for my newsletter! I send my subscribers reader exclusive recipes (recipes like Paleo Chocolate Chip Cookies, Paleo Carrot Cake Banana Bread and so much more) as well as special deals and giveaways. Simply leave your email below and you will be added automatically. And no spam ever. Promise.